The book begins with a description of the changing Inuit way of life in the late 19th century. Harper describes Inuit culture in detail, as well as interactions with newly arrived European fur traders. Here we are introduced to Nuqallaq, a difficult man, but a respected Inuit leader. Harper weaves this particular Inuk’s story into the general Inuit social structure, giving the reader a strong sense of familiarity with the surroundings in which the fatal confrontation will take place. Janes, originally from Newfoundland, arrived on Baffin Island in 1910 as part of the influx of traders. He returned several times over the next few years, staying through the winter for the first time in 1918. Unfortunately for Janes, he was stranded when his backer did not send a ship the following summer, nor the next. Janes became so desperate that in 1920 he tried to return home by dogsled across the Hudson Strait. When that failed, he joined a nearby Inuit community in Cape Crauford, despite the presence of Nuqallaq, with whom he’d had prior run-ins. 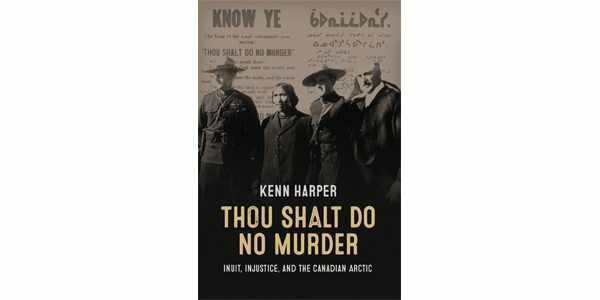 The second part of Harper’s book comprises a close examination of the events leading up to the killing, including Janes’s increasingly erratic behaviour and his threats against the Inuit. As the situation escalated, the Inuit community came to the conclusion that Janes represented a danger that needed to be removed. As the group’s leader, it fell to Nuqallaq to keep his people safe. After careful consideration and discussion with community elders, Nuqallaq took the action deemed necessary and killed Janes. There are several moments in Thou Shalt Do No Murder that make a reader pause for reflection. The most profound involve the vivid descriptions of the region’s weather and geography. There is no contact with the outside world, mobility is limited, and there is nobody nearby who can provide help. Imagine living in such close quarters with a man who is threatening to kill both your people and your dogs, which are essential for survival. It is hard not to empathize with Nuqallaq, given the situation in which he found himself. Also notable are the different cultural approaches to male-female relationships. While Canadians have historically placed emphasis on the extent to which a husband possesses his wife, it is not uncommon for Inuit partnerships to be more fluid. Janes’s female companion had a relationship with Nuqallaq several years before the killing, something Janes considered unforgivable and surely contributed to his negative feelings toward the Inuk. While the amount of background information sometimes threatens to overwhelm the actual trial, this material is so interesting – and Harper’s writing so vibrant – that it does not impede the narrative, or preclude thought-provoking questions about Canada’s long-standing and ongoing negative treatment of the Inuit.